A new chart is presented each weekday of a stock or industry poised to make a move. The final decision of when to buy or sell is left up to your further analysis. Ariba has been on a steady downward spiral, losing over 90% of its value, since forming a double top on its daily chart in September at 173.50 (9/5)-173.00 (9/25). The stock also made a failed double top on its weekly chart (see below) in September. Yesterday, 2/28, the stock fell 0.75 to close at 16.50, its lowest close ever, after hitting an all-time low of 16.19 intraday. 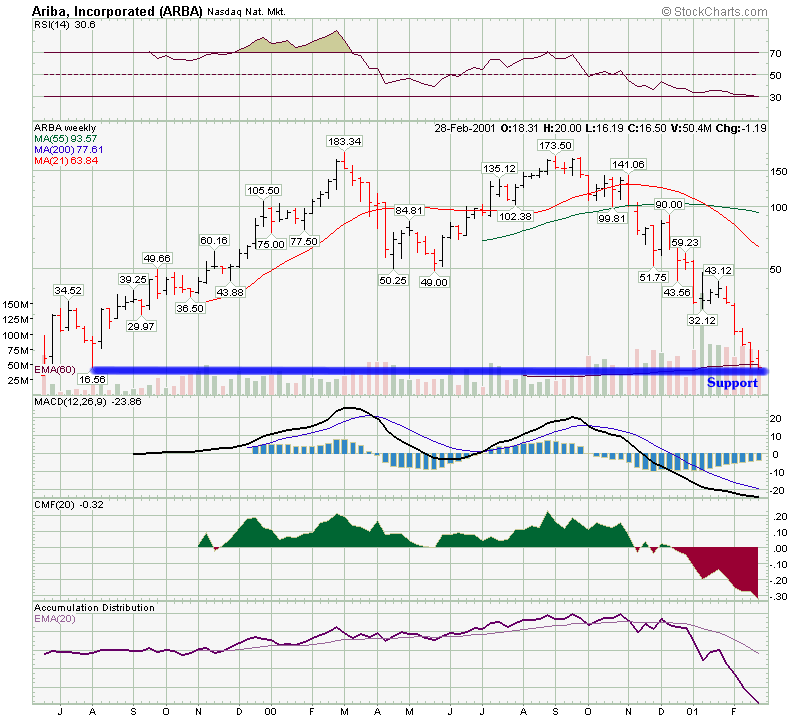 The stock is now at a critical support level--the 16.55 level marked its previous low in 8/99. Long term technical indicators remain strongly negative, with Money Flow, MACD, OBV, Accumulation/Distribution all making new lows and confirming the recent plunge. Short, long, and intermediate term trends remain down, and the stock is unlikely to disobey the laws of gravity any time soon. A sell short signal would be given if the stock fails to hold yesterday's low of 16.19, with the next downside support another 20% drop away at 12.50-12.75. See our breakout watch section for commentary and charts on these stocks.